It’s that time of year. The snow is melting, brown grass is turning green and blooming flowers are sprinkled with dew from last night’s rainfall. Everything that was suddenly is again, and there’s really only one way to describe it: beautiful. Even though my favorite season is fall, it’s hard to resist spring’s natural charm. The clusters of colorful blooms, chirping birds and the calming scent of rain are all enticing, but even the little things hold special meaning. Mud isn’t just mud; it’s a reminder that change is on the horizon. The rain, the rise in temperature and the mud all make it possible for new growth to emerge from the once-frozen ground. It’s this flux in weather that inspires me to take a look at my own life. What things do I want changed? How can I improve? For you, this can mean a multitude of things, from changing the way you eat, to taking on a new hobby. But no matter how you look at it, spring is a great chance to plant the seeds of change in your life and watch them grow throughout the year. To help inspire you, we’ve compiled some of our favorite colorful, spring-inspired designs. From the Spring Fling Floral Tote to the Lemon Bursts Afghan, you’ll discover just the right pattern to bring some color into both your wardrobe and your living room. We’ve even got patterns for little ones. Enjoy crocheting the Sunny Days Baby Mobile, which features an adorable crochet sun, rainbow and cloud. 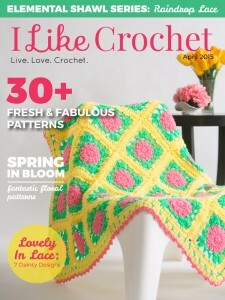 It doesn’t matter which project you make first—you’re bound to catch spring fever after viewing these patterns.